A beautiful vintage 1932 Rolls Royce. 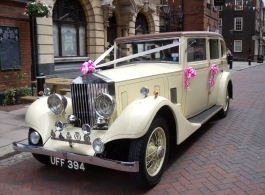 This vintage Rolls Royce wedding car has been totally and painstakingly restored to its original glory. The bodywork is in beautiful Magnolia cream with Gold pin striping and a light tan leather roof. Colour co-ordinated spoke wheels & brass chrome trimmings complete the exterior charm. The interior is finished in light soft tan leather with rich walnut woodwork and would ideally seat up to 3 passengers although it can take 4 depending on age & size. Price includes flowers and bows & ribbons.